Exodus 3:14 God said to Moses, ‘I AM WHO I AM.’ And he said, Say this to the people of Israel, I AM has sent me to you. Psalms 33:4 For the word of the LORD is upright, and all his work is done in faithfulness. Ruth 1:16 But Ruth said, Do not urge me to leave you or to return from following you. For where you go I will go, and where you lodge I will lodge. Your people shall be my people, and your God my God. Romans 12:1-3 I appeal to you therefore, brothers, by the mercies of God, to present your bodies as a living sacrifice, holy and acceptable to God, which is your spiritual worship. Do not be conformed to this world, but be transformed by the renewal of your mind, that by testing you may discern what is the will of God, what is good and acceptable and perfect. For by the grace given to me I say to everyone among you not to think of himself more highly than he ought to think, but to think with sober judgment, each according to the measure of faith that God has assigned. Matthew 15:18-20 But what comes out of the mouth proceeds from the heart, and this defiles a person. For out of the heart come evil thoughts, murder, adultery, sexual immorality, theft, false witness, slander. These are what defile a person. But to eat with unwashed hands does not defile anyone. Revelation 21:7-8 The one who conquers will have this heritage, and I will be his God and he will be my son. But as for the cowardly, the faithless, the detestable, as for murderers, the sexually immoral, sorcerers, idolaters, and all liars, their portion will be in the lake that burns with fire and sulfur, which is the second death. My hope and prayer is that you are a reliable/trustworthy type of person. Both in the small things of life (like being someone that can be counted on to show up for work every day) but also in our faith. 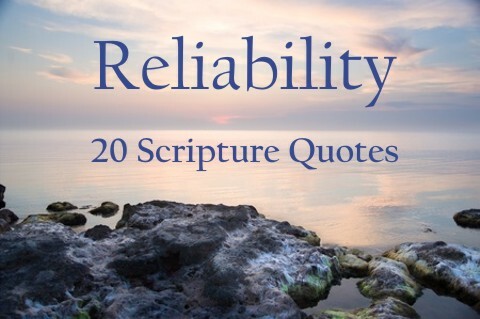 Is you faith growing and can it be said of you that you are reliable in matters of spirituality? Praise to the Lord that He is patient with each of us.